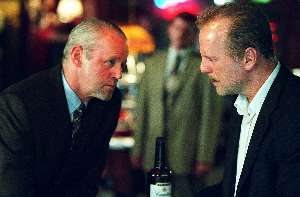 Cast: Bruce Willis, Mos Def, David Morse. Story: A washed-up cop takes a witness 16 blocks to the courthouse. Running Time: 1hr 45 minutes. 16 Blocks is your standard Bruce Willis underachieving-aged-cop-with-a-big-heart and-a-weakness-for-the-sauce nonsense, but it's realised particularly well. "Take this witness to the courthouse, it's only 16 blocks away and you've got two hours to do it." What can possibly go wrong? Well, this is Bruce Willis, so it's not long before the bullets start flying and the blood starts spilling. The body count is low in this one - it's more of an A-Team shootfest where no-one can hit a barn door at ten paces - but the tension is still high as Brucie gets deeper and deeper into the doo-doo as the morning progresses. Bruce has made a great transition from action hero (Die Hard) into wheezy wrinkly (Hostage) and he gives a fine performance here. 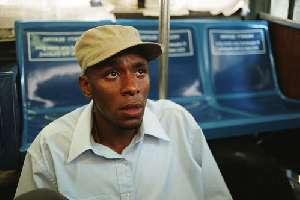 His ward, hip-hop artiste Mos Def (unwisely cast in the past as Ford Prefect in The Hitchhiker's Guide to the Galaxy) puts in the best performance of his career so far (which isn't saying much), but for some reason deems it necessary to adopt a nasal voice that is as irritating as a moth flying in your face for the duration of the movie. He doesn't half bang on as well, wittering on about everything and nothing, with his crowning glory being a "riddle" that has been shamelessly stolen from the internet. Why on earth do scriptwriters do that? Surely the meanest of intelligences would tell them that if they saw it on the internet, so will many of the viewers. Plotwise there's nothing here that we haven't seen many times before. The final twist is more original, but is a little shaky in the plausibility stakes and gives the final reel a sugary coating that it really doesn't need. We have had enough of Hollywood's rose-tinting and, particularly with a movie that was always going to be an also-ran, it would have been nice to see a braver ending, which could have elevated it from a seen-it-all-before action flick to a quality and genuinely impressive adventure. The very first scene, though not particularly original, is very well done, with Brucie recording into his dictaphone that he's been set up, before starting us on the trail to find out how that happened. If this quality had been allowed to filter through to the end without the Hollywood saccharine monsters taking over, I would have been toying with a 5/5 rating - as it is, it only just scrapes a 4. 16 Blocks is a nicely made run-of-the-mill thriller. Nothing novel or particularly creative, but all sown up with a satisfying feel that serves to justify the price of a ticket. No-one will remember it next year, but it fulfils its purpose. Testosterone Satisfaction Rating: 2/5 - some guns and action. One use of the F word. To enjoy this film you should be: at a loose end one evening. 16 Blocks was released in the UK on 27th April. down-at-heel private investigator from "The Last Boy Scout", and a touch of his sweating overweight character in "The Jackal".